We have seen a lot of ridiculous stuff from SiteLock recently, but this has to take the cake. They have now filed a DMCA takedown notice against our website for including a screenshot of their homepage on in one our posts. 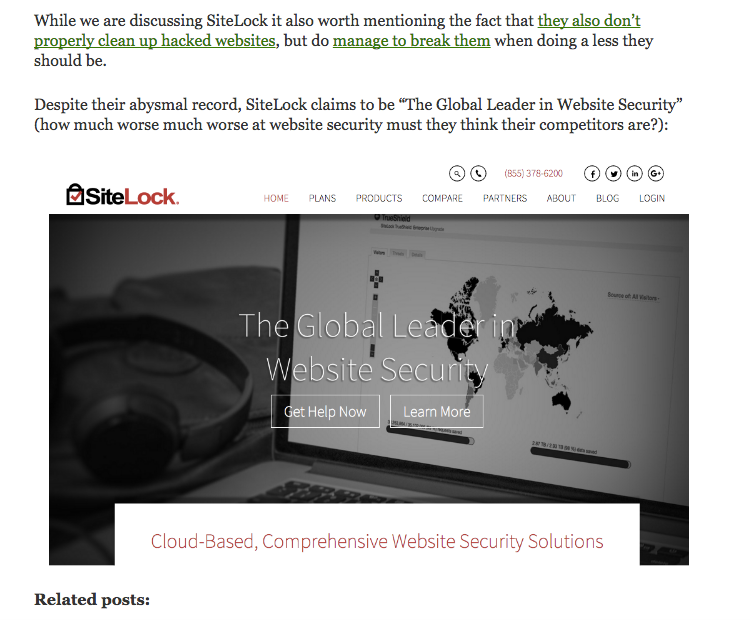 In a post discussing how SiteLock was labeling a website as being “secure” while that contained malicious code that compromised credit card credentials we had included a screenshot of their homepage backing our mention of them claiming to be the “The Global Leader in Website Security”. Beyond the fact that it is fairly clearly fair use, what is the purpose of hiding people from seeing that on our website? They also filed a notice against another image. 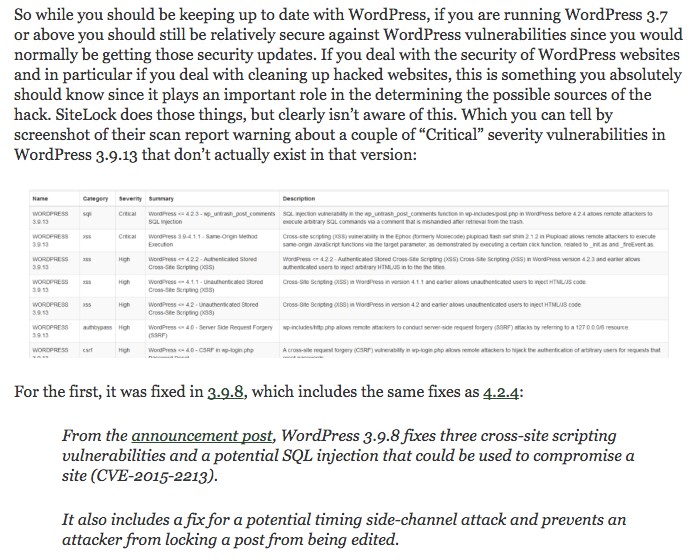 This time it is even more clear to be fair use since in a post discussing how SiteLock is falsely claiming that WordPress installations have vulnerabilities, we included the screenshot from their post to discuss the fact they were showing vulnerabilities existing in a version of WordPress they didn’t exist in that version. Worth noting is that the textual content in SiteLock’s screenshot is actually not generated by them, instead copied from other sources. What makes this even more ridiculous is they clearly now know that their post is showing that they lack a basic understanding of WordPress security, but instead of fixing their post, they are trying to hide you from seeing an image on our website. The only reasonable explanation we can think of for them doing this is that they thought they could get the pages those images were on removed by filing this, because removing the images alone doesn’t do anything to cover up what they are up to. SiteLock, LLC on the website WHITEFIRDESIGN.COM. infringing material to your server in the future. act on behalf of the owner of the copyright(s) involved. entirety, whether in electronic or hard copy format.